1 OWNER FBMSH CAMERA SAT NAV! STUNNING FULL MERCEDES SERVICE HISTORY, ONLY 1 OWNER FROM NEW! 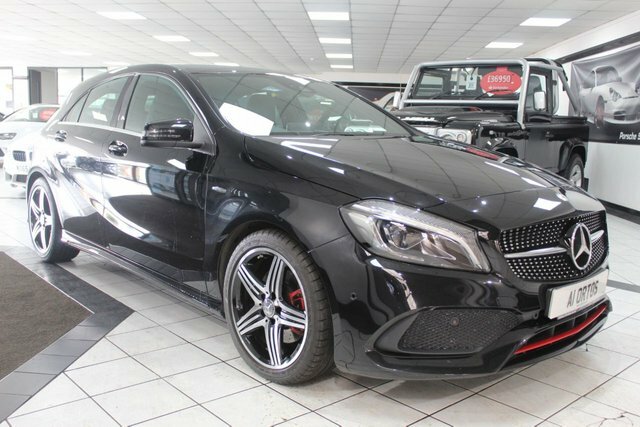 FACTORY FITTED SAT NAV (BIG SCREEN) BLACK HEATED LEATHER INTERIOR, 18 INCH AMG ALLOY WHEELS, FRONT & REAR PARKING SENSORS WITH REAR VIEW CAMERA, AUTO LED HEADLIGHTS, CRUISE CONTROL, DYNAMIC SELECT, ELECTRIC FOLD AWAY MIRRORS, BLUETOOTH PHONE & AUDIO STREAMING, USB CONNECTION, FLAT BOTTOM STEERING WHEEL, CLIMATE CONTROL, CARBON DASH INLAYS, 2 X KEYS, VERY RARE INCREDIBLE EXAMPLE, EXCEPTIONAL VALUE FOR MONEY, EARLY VIEWING IS ESSENTIAL TO AVOID DISAPPOINTMENT, VERY BEST COLOUR COMBINATION, COMPREHENSIVE WARRANTY INCLUDED, FREE 12 MONTH AA COVER, STUNNING SHOWROOM CONDITION, MUST BE SEEN NOT TO BE MISSED, FIRST TO SEE WILL BUY, BE VERY QUICK THIS GEM WILL SOON GO! A1 Ortos Ltd is authorised and regulated by the Financial Conduct Authority, FRN: 655138. All finance is subject to status and income. Written Quotation on request. We act as a credit broker not a lender. We work with a number of carefully selected credit providers who may be able to offer you finance for your purchase. We are only able to offer finance products from these providers.